Animation visionary Brad Bird makes the jump to live-action blockbusters with Mission: Impossible -- Ghost Protocol . But can he solve the mystery of The Incredibles ' sequel? Since the turn of the century, director Brad Bird has galvanized Hollywood with animated masterpieces The Iron Giant , The Incredibles and Ratatouille . Now he’s boosted a sagging spy franchise with Mission: Impossible — Ghost Protocol , his live-action thriller that has ironically blown past comics-based blockbusters like Captain America and Green Lantern to become the year’s finest action film. Bird has become increasingly brilliant at realizing his alternately hilarious and striking visions. He’s been on an undeniable roll ever since his teenage apprenticeship with legendary animator Milt Kahl — one of Walt Disney’s Nine Old Men — and his Cal Arts friendship with Pixar Animation Studios’ John Lasseter. Last century, Bird helped shape legacies for The Simpsons , The Critic and King of the Hill . This century, he scooped up Oscar statues for Best Animated Feature winners Ratatouille and The Incredibles . Stuck in the middle of Bird’s stellar resume is his sublime animated feature debut, The Iron Giant , which remains one of the most intelligent, moving sci-fi films of any format and era, despite its studio’s maddening inability to understand or market it. Bird’s made stunning films from the start, and the PG-13 Ghost Protocol , which opens wide Wednesday, fits his curriculum vitae like a virtual glove. The director talks about Mission Impossible ’s resurrection, Tom Cruise’s balls, Alfred Hitchcock’s genius, the future of his stalled disaster epic 1906 and much more in the interview below. 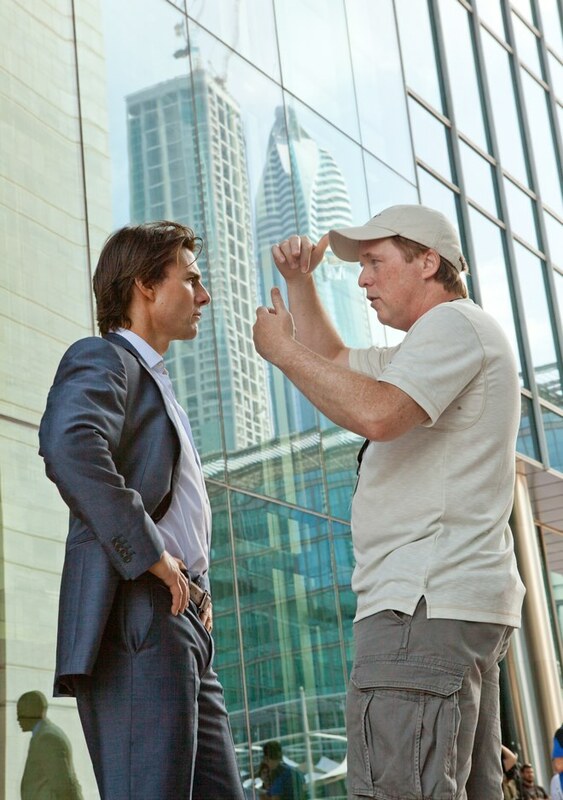 Ghost Protocol executive producer Tom Cruise and director Brad Bird share an aggressive love of film history. Wired.com: Your live-action debut was going to be 1906 , so how did you get involved with Ghost Protocol ? 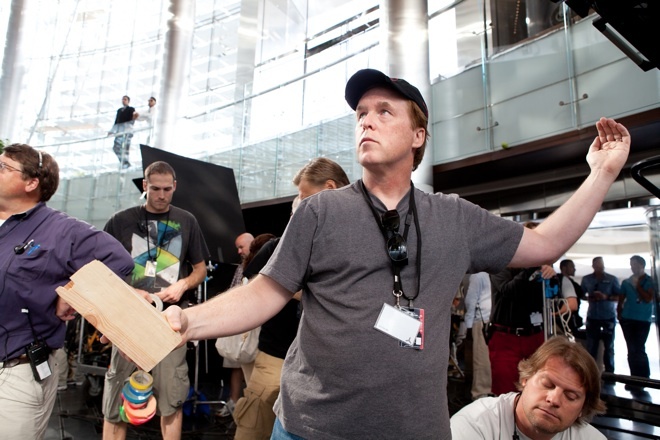 Brad Bird: It’s just one of those happy coincidences of timing. I was working on 1906 right after Ratatouille , when suddenly I looked up and a couple of years had gone by. I was still wrestling with story problems, and didn’t want the rest of my career to read, “He worked on 1906 .” I wanted to actually make something. So I set 1906 aside and started looking around for films that were already in motion. Michael Giacchino — who not only created the score for Ghost Protocol but also my previous two films, Ratatouille and The Incredibles , and had also worked with J.J. Abrams on Lost , Star Trek and the last Mission: Impossible film — and I were having lunch at Bad Robot when J.J. walked by and asked me what I was doing. I told him I was just looking around, and that night he sent me a text that just said, “Mission?” It was just one of those things that happened at the right time. It was also a chance to work with both J.J. and Tom, which sounded like a lot of fun. Wired.com: How was the transition to live-action, given that you’ve worked in animation your entire life? Bird: I had been interested in doing live-action almost as long as I’ve been doing animation. As you said, I started making animated films from a very early age. But the act of trying to figure out the language of film — which you’re forced to confront if you’re making any film, even if it’s a handmade one for yourself and your friends — made me aware that certain filmmakers were speaking that language really well. So it was great to finally make one, although it’s slightly different in how you get the moments onto the screen. But a lot of it is the same: You’re still trying to have characters the audience can connect with, and still be surprising yet somehow inevitable in retrospect when you tell a story. It’s all the language of film. Wired.com: Do you find that having worked in animation, where the possibilities are endless, has given you additional advantages that filmmakers trained in live-action might not have at the ready? Bird: I don’t know. I can’t comment on how other people approach it, but I know that animation does encourage you to pre-visualize, to be able to imagine something fairly thoroughly. If I’m explaining something to someone in animation, I often find myself picking up a pencil and drawing out what I want. You’re actually showing people what is on your mind, and you start speaking visually earlier. A lot of live-action directors have to describe things, but if you work in animation you describe things by visualizing them. That part came fairly easy to me, especially when it came time to realize the vision with cameras. And it was fun to work with a cinematographer as sharp as Robert Elswit. Wired.com: Did you find that your actors had an easy time rolling with your visualization, especially Cruise, as he was sitting on the tallest skyscraper in the world? Bird: [Laughs] They were really game, and they don’t come any gamer than Tom Cruise. He really loves doing his own stunts, and he’s also a real student of film. His deep knowledge goes all the way back to the silent era, so you can really discuss stuff with him in detail. And you can shorthand, and he’ll know exactly what you’re talking about. Even though Tom is aggressive and pushes hard to make a moment great, I’m really comfortable with that, because that’s how I like to work too. So it was just fun to be with someone who enjoys the medium as much as I do. The same goes for the entire cast. It sounds like some corny promo piece, but it was a joy to go to work with really creative people on Ghost Protocol .